These Mason Jar Margaritas from The Whole Smiths are the perfect treat to take along for any occasion. While they may not technically be paleo, they’re pretty clean as far as delicious cocktails go. 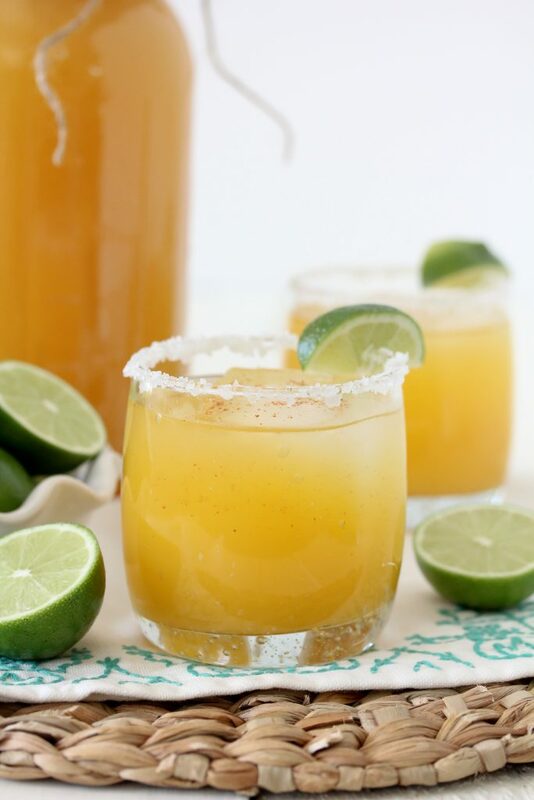 Whether it’s for a BBQ, bridal shower or game night, these margaritas are sure to be a hit. I’d be hard pressed to have to pick a favorite cocktail but if you forced me to choose I’d most likely pick a margarita. In my mind a margarita always sounds good. Whether it rainy and dreary outside or bright and sunny, I’m in. 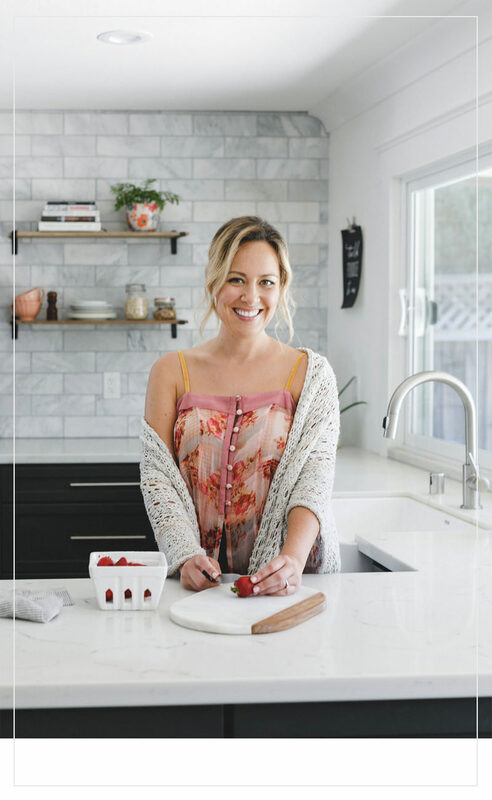 However, since this is a clean eating blog I do need to make mention that while a margarita sounds great every day, it’s not something I actually have every day. I save it for when it counts and don’t think twice about it. Now on to my favorite part of this… the mason jar! Specifically this extra large half gallon mason jar which you can find a Target or Amazon. I mean, hello. A giant mason jar filled to the brim with margarita? Sign me up. I also suggest leaving the mason jar as a super easy gift for the hostess. Or maybe that’s kind of a crappy gift? Maybe you can attach a laminated recipe card for the margaritas to make it feel more gift-y? Or is it still crappy? Oh well, I don’t even know. I do know however that the margaritas inside are bomb. On to the actual margarita. 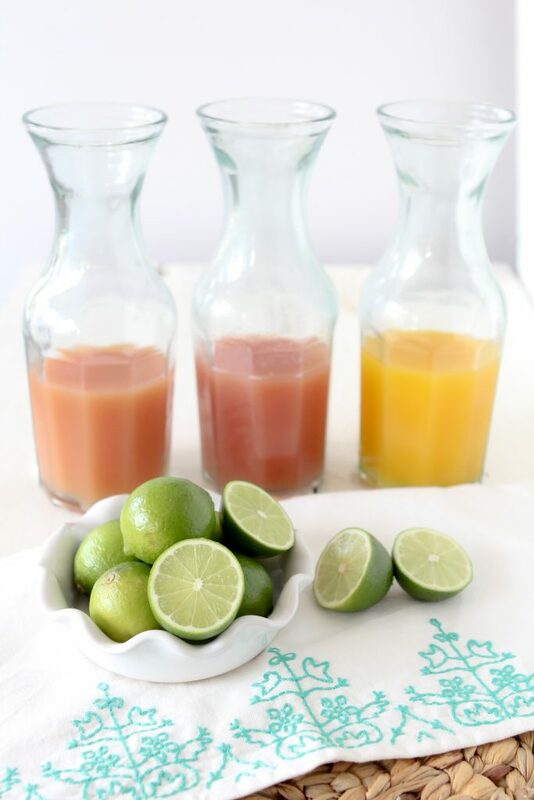 My three favorite go-to flavors are guava, mango and grapefruit. Personally, my favorite is the guava but any juice will work. For juices I really enjoy Ceres brand as they have a wide variety of flavors and no added sugars. 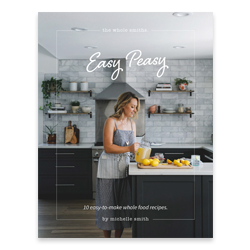 If you choose to use grapefruit know that you may want to add a touch of honey to sweeten things up a bit as pure grapefruit juice is pretty sour particularly combined with the lime. I’d like to make note that I don’t like my margaritas to be overly sweet. With that said, sometimes it does need an extra kick of sweet (as I mentioned with the grapefruit) and I’m happy to add a touch of honey simple syrup. To make that, use a 1:1 ratio of honey to water and gently heat it in a sauce until the honey is dissolved and let it cool. If you like yours a little sweeter, feel free to sweeten it to taste. I also like to add some some special touches like fresh herbs, spices or garnishes to my margs as well. Adding some thinly sliced jalapeño to my guava margaritas, basil infused into my peach margaritas and a bit of cayenne pepper to alllll of my margaritas makes for an extra tasty drink. The recipe below was written to reflect a basic margarita and give you a little flexibility to make it your own. Let’s see, what else would you like to know? Make sure you have a LOT of limes if you’re planning to them yourself. The limes shown in this picture were all of the limes I squeezed of make 1 and 3/4 cups of juice. 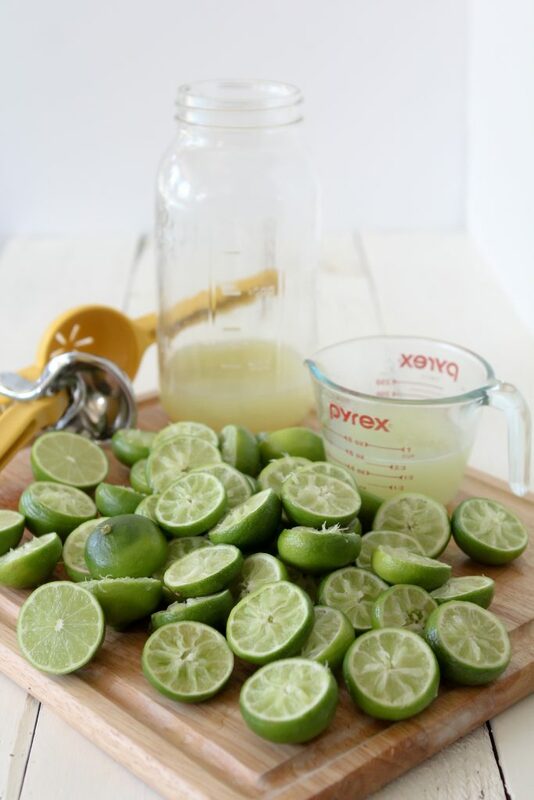 Fresh squeezed limes are always worth the extra effort IMO but if you’re in a time crunch there are some great lime juices available at the store. 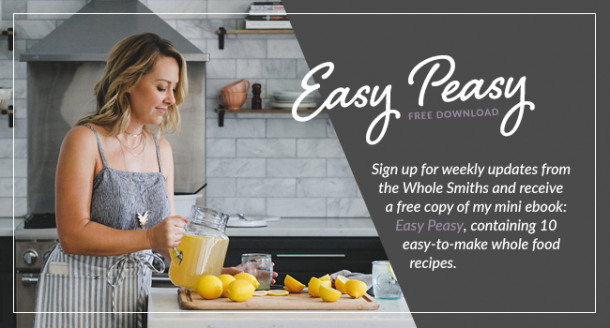 If you’re a fan of clean(er) cocktails, make sure to check out my Blackberry Bramble and Dairy-Free White Russians. With that, I think you’re all ready now to become your own Mason Jar Margarita experts. 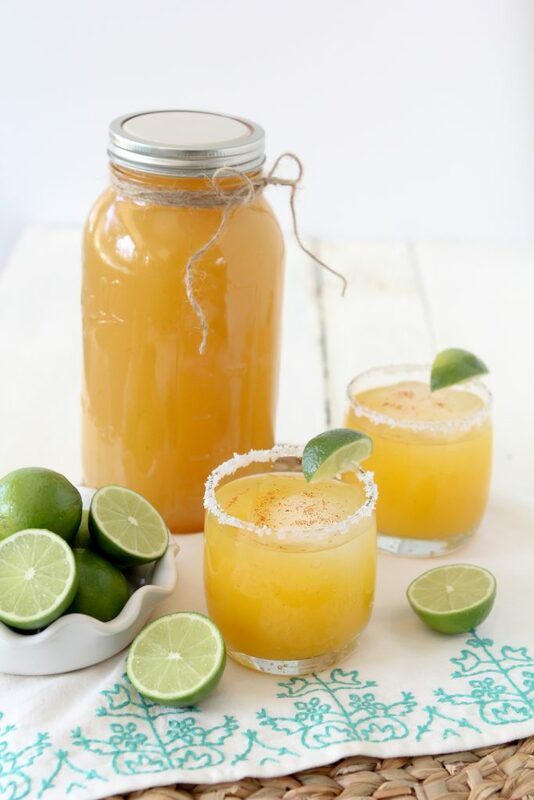 For more highly Instagramable Margaritas check out this margarita roundup from Drizzly, 11 Instagrammable Margarita Recipes. 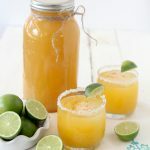 These Mason Jar Margaritas from The Whole Smiths are the perfect treat to take along for any occasion. While they may not be technically paleo, they're pretty clean for a delicious cocktail. 2 [1/2] cups juice mango, guava, peach, etc. 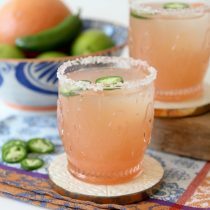 Other optional ingredients: Thinly sliced jalapeños to garnish if you're making the guava margaritas a small handful of basil to infuse into the peach margaritas or 1 teaspoon of Trader Joe's Chili Lime seasoning to add into the salt for the rim of the glass of your mango margaritas. 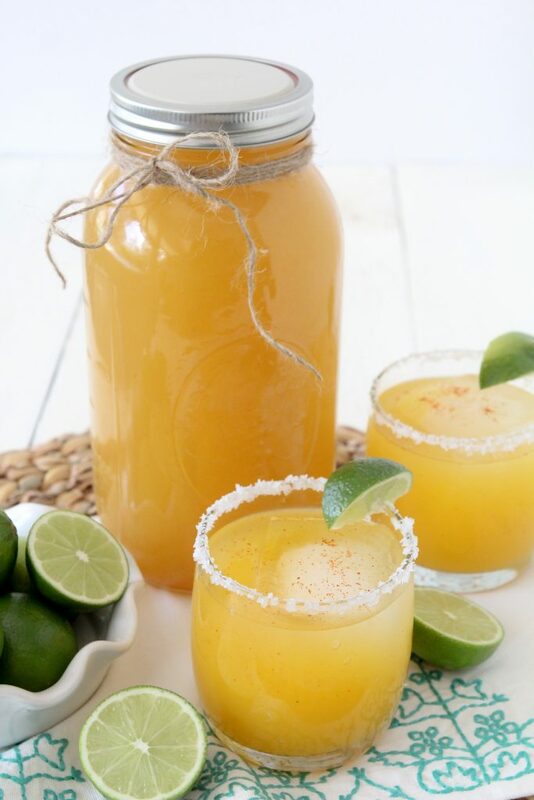 Add the lime juice, fruit juice of choice, tequila and Gran Marnier and optional cayenne to a 1/2 gallon mason jar and stir to combine. 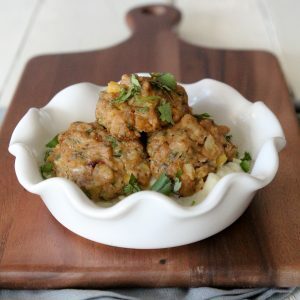 Add any additional ingredients you may like to infuse such as basil. Cover with the lid and refrigerate for a minimum of 4 hours prior to serving. To serve, wet the rims of a glass with a bit of lime juice and dip into the salt to rim the glass. Add the ice to your cup after you have salted the rims and pour margarita into the glass.